Sometimes prospecting for new business can get rough. Can you remember a sales call you made to a prospect, and they seemed less enthused about your call? Do you remember how they peppered you with objections, tried to undo your sales pitch by telling you they already have a supplier, or dismantled your attempt to win them over with humor? 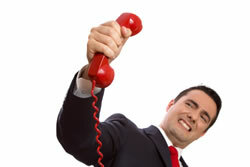 Welcome to the real world of cold calling – sometimes you run into a rough prospect. Under pressure things can go wrong for you, and as a result you can find yourself frustrated by it. Some of the ‘drills’ prospects put you through can make you feel like quitting, but I’m asking you to re-consider. Don’t throw in the towel, you just need a better call script that structures what you’re saying to prospects so they don’t ‘bop’ you over the head with their objections. Trust me when I say that being well prepared in scripting your calls is your greatest weapon to fend off the aggression of those rough and tough prospects. You see the main reason behind why prospects become arrogant and mount a resistance to your calls is generally because of two things; The first being that you have called them at the wrong time, and the second being that your call script didn’t do its job. In other words, your script did nothing to catch their attention right away, and ‘turn them on’. When prospects are confused by your call, and have to think about why you called them, they can lose focus quickly and grow tired of your weak sales pitch. When prospects are confused by your call they try to brush you off the phone with their arrogance. It works with so many other salespeople, why not you? Take a close look at your sales call script. If its a paragraph, or more in length (50+ words), it’s way too long for prospects to understand, and pay attention to. Also, the longer the sales call script, the more it sounds like another ‘elevator pitch’ – BORING! We are paid to make sales calls, and sometimes they work, and other times they don’t. However, if we script our calls carefully and get to the point quickly, prospects have an easier time understanding the reason for our call, and understanding leads to good conversation with prospects. My suggestion? Throw out that ‘blowhard’ script of yours – your prospect hates it. Develop something shorter and to the point so your prospects don’t have to struggle to figure you out. Less is best so give it a try! You are currently browsing the The Gold Call Blog blog archives for July, 2012.